Because we missed out a few of our other favorites last time. Anyone who watched TGIS in the '90s knows how big the Bobby-Angelu love team was. The two had super good chemistry on-screen that people assumed they would end up together IRL. They didn't, but Bobby's not shy to admit that he did want to take things further back in the day. 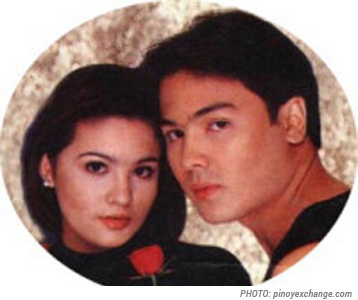 Before #DongYan and Karylle happened, Dingdong-Antoinette was THE biggest love team in showbiz. Iñaki and Bianca? Yup! The two were public about their relationship, but eventually broke up in 2005. Another former TGIS love team, Kim Delos Santos and Dino Guevarra got married but eventually filed for annulment in 2010. Their breakup was highly-publicized and fans were heartbroken to find out the two had serious marital issues. Of course we can't leave out Sunshine and Polo! The pair caps off our TGIS love team faves. Remember the movies Honey My Love So Sweet and Kiss Mo Ko?